Work has begun on a memorial garden celebrating the mining heritage of the village of Townhill. 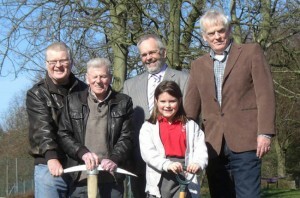 Local schoolchildren were joined by members of the community, ex-miners and local councillors at an opening ceremony for the garden in Townhill Park yesterday (Monday). Pupils from Townhill Primary School have been involved throughout the design process for the garden, the first phase of which will incorporate an “education through play” and storytelling area. A striking, themed mosaic created by pupils will form the focal point of a storytelling area. Life-sized wooden sculptures of adult miners and children who worked in the pits, as well as a pit pony, all carved from fallen trees from Townhill Wood will also feature in the garden. Leader of Townhill Mining Heritage Group, Bill McCulloch explained that what started off as an idea two years ago has been developed and voted on locally, with £76,000 funding from Fife Environmental Trust, the local Common Good Fund and Fife Council helping make the vision a reality. Play equipment will reflect aspects of mining life, such as a wooden train to represent the pugline and climbing frame signifying the old ladders between levels in the pits, with information panels telling the story of children working in the mines. A second phase to be added to the garden at a later date will incorporate a timeline pathway where park visitors can walk in the footsteps of the Townhill miners throughout the years with information panels depicting the village’s history and the lives of the men, women and children who worked in the pits set into the path itself.